Thank you all for turning up in Humburg to support the NPP Germany Branch to bid a befitting farewell to our Brother George Kofi Asiamah who has been called to Glory. Our Comrades in Hamburg the Hamburg Chapter as a whole led by it's Hardworking Chairman Comrade Augustine Opoku deserves a huge thank you for making sure everything went on smoothly. Notwithstanding the fact that it was a seldom and despondent event, it also brought out the best in us, we showed the family that, they were not alone but have the whole NPP Fraternity solidary behind them. Each and everyone deserves a Big Thank You for the contributions you made, to every chapter, every member, well done, 2.000 Euros cash donation to the family, the Wreath on the grave and your presence demonstrated to the whole world how NPP Germany Branch stands with its own in all situations, it signified strength, love, oneness and shared ideology which bonds us together. 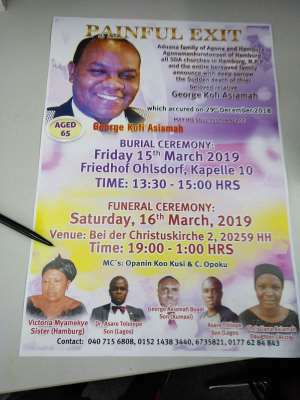 Not going to mention names, I thank all members present and those who couldn't make it, may the good Lord Richly Rewards You abundantly for the support and love you showed the family of our departed Bro in their time of Grief. Rev Alex Acheampong, Chairman NPP Germany Branch. Nana Boateng, NPP Germany Branch Communications Director.